“Dear Anne-Marie, I am writing this letter as a testimonial to the hard work you put in for mine and my new wife’s wedding in July 2010. From the first consultation back in 2009 we were confident that you would provide us with a good service and quality products. We were wrong, you provided us with a fantastic service and an outstanding quality of flowers for each arrangement we requested. Throughout the months before the wedding you kept us very well informed on the progress whilst continually showing us excellent samples and photos which significantly helped us when choosing colour schemes, shapes and size of flowers. We were very impressed with your knowledge on varieties of flowers and understanding of which flowers would look best next to each other, as well as your fantastic ideas on colour-coordinated sands with different vases. Not to mention the fact that you arranged with the church and reception venue when to bring the flowers and where to put them, well in advance of our big day. Your wonderful flowers helped make our wedding day the most special day of our lives and I would make no hesitation in recommending you to my friends and clients as the service you provided us really was second to none. 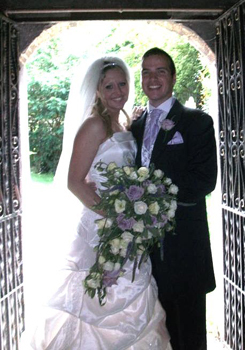 We would just like to say a big thank you for preparing our wedding flowers for us on 14th August 2010. They were so lovely and exactly what we wanted. Your service was outstanding and we are very grateful for your help ensuring the flowers were perfect for us. Thanks again my flowers made my day! Anne-Marie was attentive, organised, helpful, caring and extremely professional giving me tips and ideas. She made me more than just the flowers – she gave me the happy wedding bug which I am extremely grateful for. My flowers are personal to me as Anne-Marie was flexible and creative incorporating my grandmother’s pearls and jewellery as my something old/borrowed. Super friendly service that I am grateful for. Anne-marie was constantly devoted from start to end and seeing as i wanted very specific types of flowers which had meanings to them was prepared to be told that i wouldn’t be able to have them but anne-marie worked extremely hard to make sure i had exactly what i wanted in my flowers and nothing was too much trouble. I have never known anyone so willing to make your day exactly how you want it and she constantly works very hard to make it happen. As I am a tall lady (5ft 11″) I wanted a very big bouquet of lillies, from my waist to virtually my ankles. I knew exactly what I wanted in my mind and somehow, Flowers by Anne-Marie more than managed to duplicate it! I was stunned and overwhelmed – it looked amazing! Throughout the buying process, anne-Marie and her team, have been more than helpful. They have offered advice, from experience, which I have found very useful. Anne-Marie went above and beyond my expectations, even down to making a silk button-hole for my 2 year old grandson, who was one of our page boys! Excellent service, Anne-Marie is wonderful and her creations are stunning! She worked with us every step of the way to ensure our flowers were perfect. Anne-Marie provided an excellent and friendly service and took the stress away, her ideas and excitement really put me at ease. On the wedding day WOW I was blown away and reduced to tears as she had exceeded my thoughts and expectations with my flowers and the flowers in the room. Anne-Marie deserves an award as she cares and does everything down to the last detail and we will always be very grateful to her for helping make our wedding day special. Anne-Marie was friendly and got to know us well, discussing my ideas for the wedding. She went away and produced a sample arrangement that exactly matched what I had been thinking of, no hassle or waiting, we had complete confidence in her abilities, and on choosing the flowers I have never seen such beautiful roses. I have pressed some of the petals to keep! – good local connections with flower sellers. Well done.